Junk Chic Cottage: Summer or Fall?!!!!! Fall is in the air but still is summer!!!! I decided to start some outside fall decor. It was not an easy task since my summer flowers are still holding on. They are just not ready to say good bye. So I thought ok what to do??? 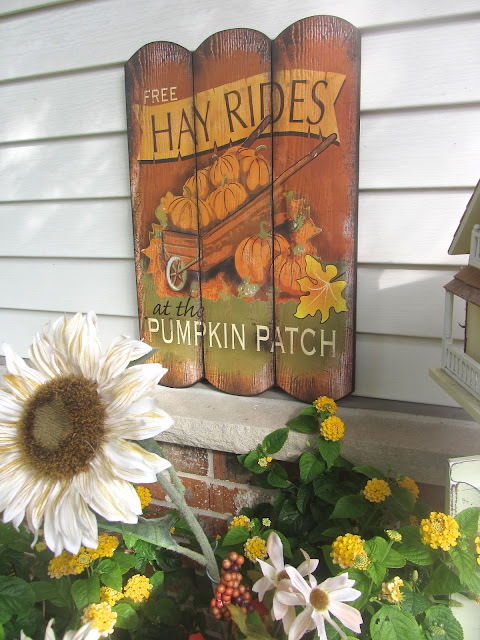 I mixed what is still hanging on of summer with fall decor. A little crazy I know but the only compromise I could find since I was not ready to throw away the flowers that still have some life in them. So I moved all the summer that was still thriving from the back deck to the front yard under the tree. This way I only have to water the front yard now. They are starting to get a little scraggly from the cooler temps and the bad water we have in our town but they still make me smile so I am holding on to them a little while longer. So we still have a little bit of summer hanging around. Petunia's love and thrive in most weather conditions. They like it hot as long as they get watered and they like the cool nights and cooler days too. They are little troopers that do not want to say goodbye. I got my front door decorated for fall. I made a wreath. 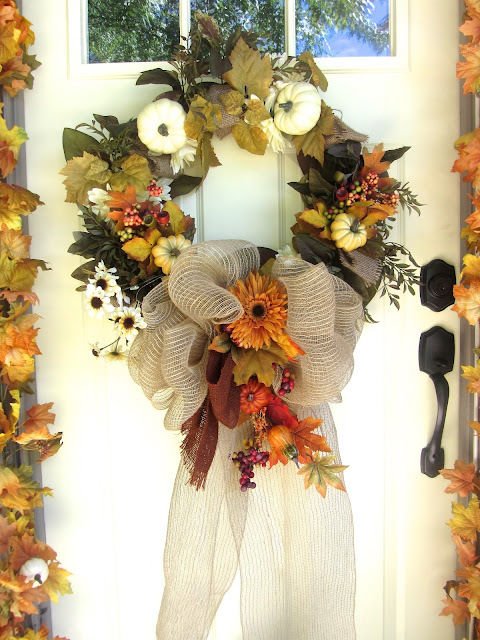 I got a basic wreath at Michael's Craft Store and added all the pumpkins and flowers and burlap bow to the wreath. This way I could mix in some white and burlap with the oranges and yellows. I like the way the colors pop on my yellow cottage door. These summer plants are still thriving too. 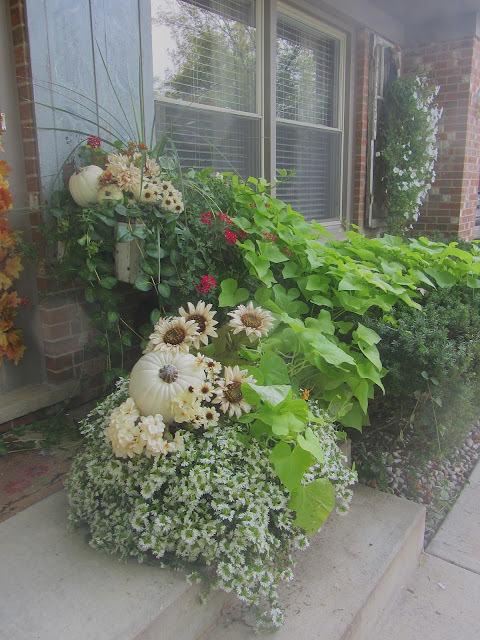 The sweet potato vine is taking on a life of it's own so I just decided to add the fall decor to the summer plants. A little crazy I know but this way my summer plants can have some more time. I brought around my white wagon and the two plants in the wagon are going strong. I can't remember the name of these pretty little yellow flowering plants but they are doing great and are fall in color so they looked cute in the wagon. I added some faux fall flowers and decor to the wagon in with the live plants. 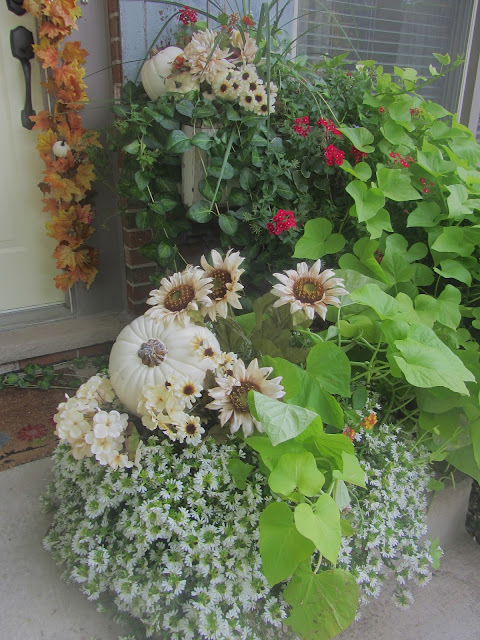 The sweet potato vine in my watering can and yellow petunias are still going great too so I just added them to the decor too. Found this cute sign today at Home Goods. Loved the colors and the shape of this sign. So there you have it. Summer is almost saying good bye and fall is moving in. It is kind of fun having the live plants still from summer mixed with the fall faux flowers and pumpkins. Hope your fall decorating is underway. Kris, this is the perfect transition into Fall, I'm still in awe of those Petunias, I just cannot get them to grow here. Your porch is adorable!! 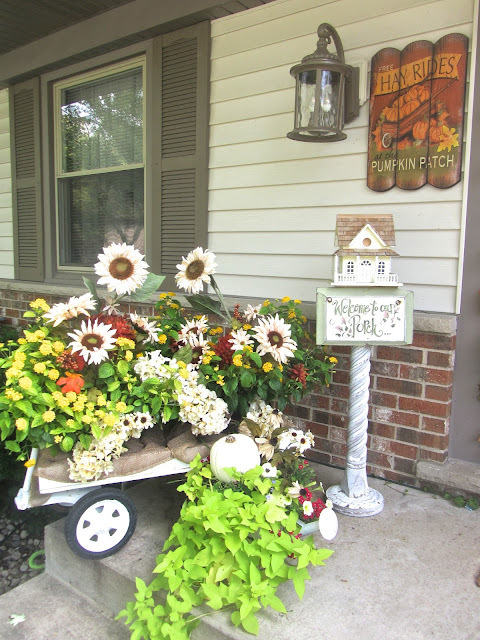 We are still having summer weather where I live in Ontario as well...I have done much the same as you, tried to incorporate my fall decor with my summer flowers...seems a shame to throw them away if they are still blooming...I LOVE your porch!! I love your porch and that wreath oh my! We are going to have high 80's today here in the Mid-Valley. I have done a little fall decorating too! Just enjoying these final warm days. Enjoy your day. We do not have a Home Goods in the State. However our little town will be the first early next year. I am so excited. Have a great day! Oh Kris, everything looks great with your summer flowers. Your wreath turned out great - love all the decor on front door. Please note I have changed my email to fergiesfineries@att.net. I tried to change on profile but it doesn't change. So pretty. In AZ we mixed faux and real plants all the time. I love the little wagon! Very welcoming, Kris. I love that wagon. Well what ever the season everything looks stunning! Kris, your transition looks really good! I really like the wagon - and the one in question looks like lantana flowers, but can't tell for certain without a closer view. My potato vines were driving me crazy - very needy of watering every day with their big potato roots in the containers, so I yanked them out and sent them to recycle with the trees on the porch! Aren't I a mean garden mom, lol? Your front door looks great too. Kris, your flowers still look gorgeous!! I love the sweet wagon-so cute!! Oh my goodness, this just screams come inside and have tea with me. It is all so beautiful. Im loving your fall touches they are beautiful. I think it's a great idea to mix your Fall décor with the summer flowers. Flowers are flowers (to me). Yours are still healthy, so I wouldn't dare get rid of them yet! I have petunia's on my front porch that are still doing ok (sort of). They're kind of leggy though. I think your front entry way looks very pretty! I can't believe your summer plants are still thriving! Ours froze last week, so out they went. I haven't even thought about outdoor decorating yet. Your yellow door was a good choice! Summer is for sure hanging on in Texas. Our flowers will get a resurgence before our first freeze. Your petunias are amazing. I couldn't stand to get rid of any of those gorgeous flowers either. I can't believe they are still so beautiful. You certainly have that manic touch! Wonderful mixture. What you did worked beautifully. The design fits the temperature and the season well. What a great idea!! I love your summer flowers with your fall décor...so pretty!! Oh, everything just looks so beautiful Kris! I love the cascade of white petunia's. You have been blessed with such a wonderful talent of being able to design and decorate and grow those beautiful plants. I like how you incorporated summer and fall. Being in the South - we only get summer for the most part. I wish I had your talents and your porch! Oh my goodness, your yard looks beautiful! We have a few things that survived our summer, but even with regular watering, the heat finally gets to them. I really like how you added some pumpkins here and there among your summer flowers. And that wreath -- just perfect! Kris you truly are amazing, I am in LOVE!! Everything you have done is just gorgeous. I can't believe how well your flowers are still doing. I can see why you are holding on to them. You incorporated them beautifully. That wreath is great the bow and added pumpkins are perfect. I wish I had the push to do the decorating like you do. I am a lazy old woman! Your yard still looks so lush! I'm getting tired of watering the flowers. LOL. Lovin' your little white wagon! Kris ... Your plants are beautiful ... keep them as long as you can. I don't know how you get them to grow so big. 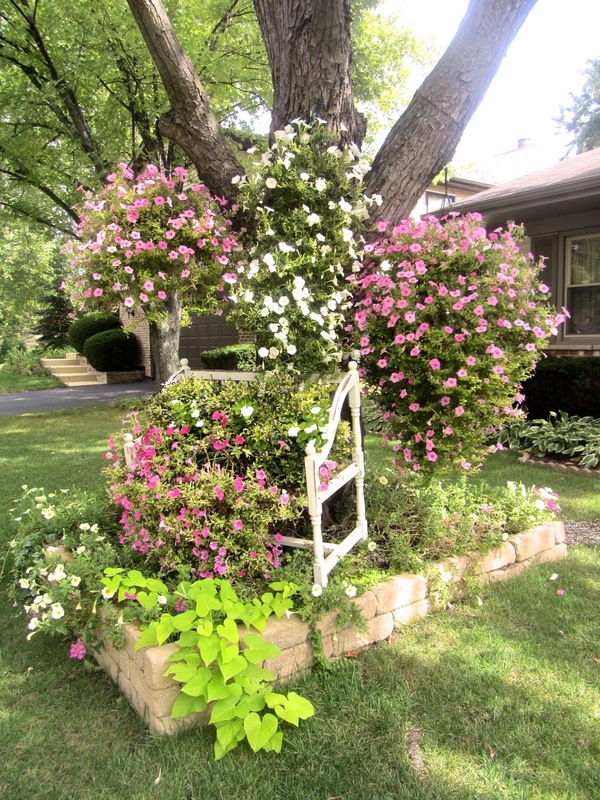 The potato vines just add the right color and so healthy looking. My deer would love them. Thanks for sharing ... love how you combined the two seasons. Always so pretty, Kris. Your plants and flowers are soooo gorgeous! Kris your yard is gorgeous! Your plants still look amazing! 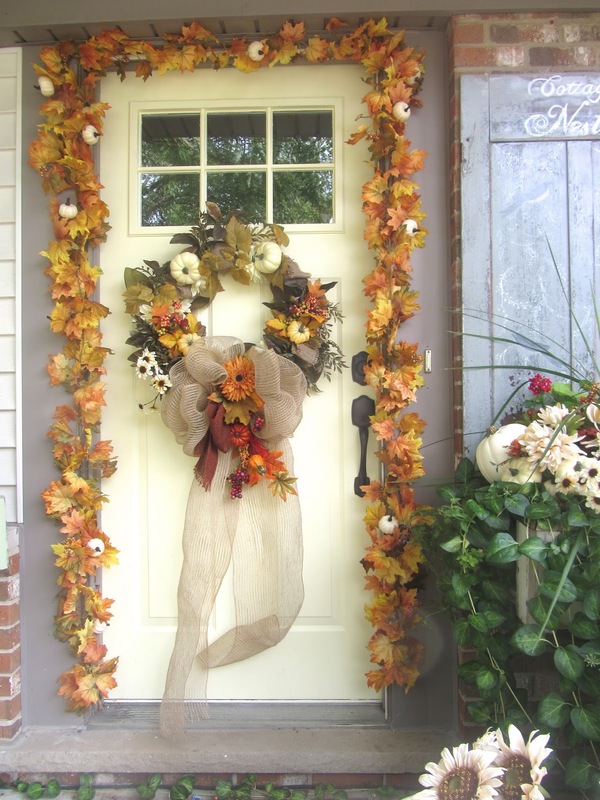 Love your beautifully decorated porch! everything still looks beautiful, kris! 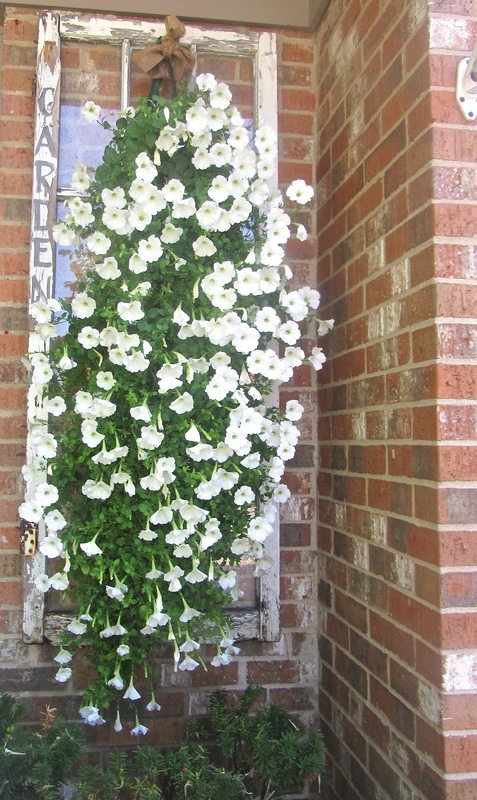 my petunias dried up a month ago:( your porch is so welcoming--love the wagon! happy fall! Kris everything looks so beautiful! I especially love your wreath. Beautiful! Summer is still here in Florida. It will be in the upper 80's all week because we have a "cold" Front moving in. Oh, Kris, your fall decorating is simply gorgeous!